I was absolutely in love with Shel Silverstein when I was a kid. I still have all of his books displayed in my apartment. Listen to the mustn'ts is my motto in life. I still think it applies to me now more so than I was a kid. love this! thanks for the smile. That first one is so sad, and so true nowadays, but I loved it. My favorite was and is Standing is Stupid. His books were always my favorite! Love the Giving Tree!! 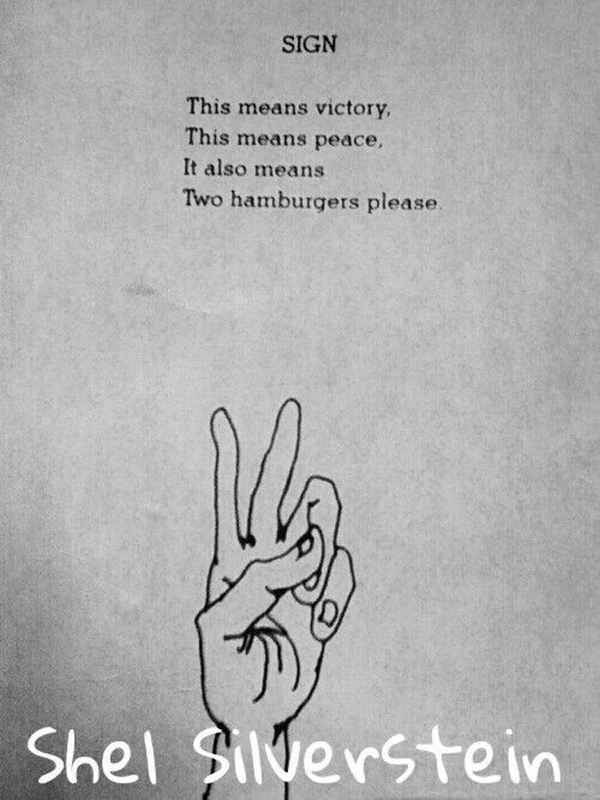 That hamburger poem is amazing too! 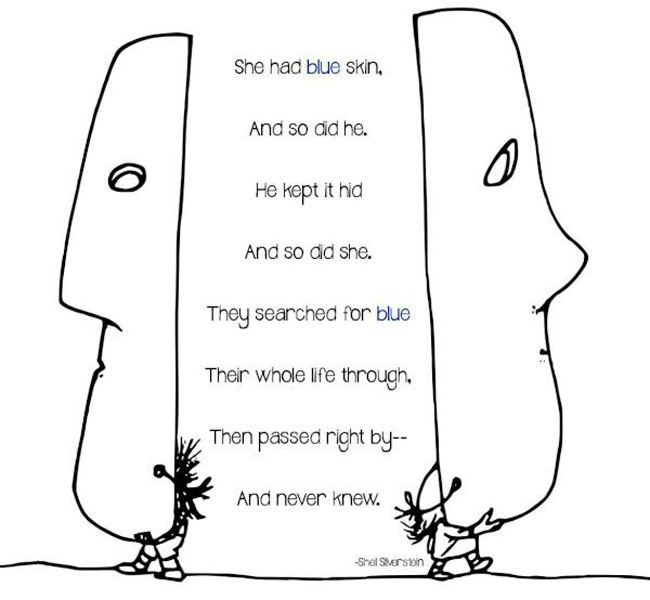 Aw I loved Shel Silverstein! I seriously need to go buy some of his books. I miss reading those! I LOVE Shel Silverstein! I totally agree that they are very well applied to adult life! I remember reading Amelia Bedelia books as a child too...and I could still sit and read them today as well. 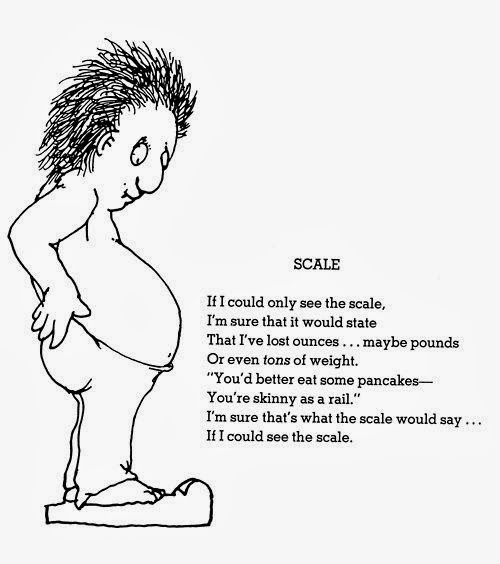 Oh how I love Shel Silverstein. My favorite childhood story that applies with such importance in adulthood is The Velveteen Rabbit. I even had my brother read the passage about what it means to "be real" during my wedding ceremony. Tears all around. Love "listen to the mustn'ts"... love love love! I also love a couple of throwback Dr. Seuss books that I still have on my nightstand to this day. I love Shel Silverstein! I remember in elementary school checking those books out of the library like, a million times. I always find it interesting to revisit something I loved as a child and to find new meaning in it as an adult! I love all these!! I still have all his books somewhere. I remember reading these as a kid. I wonder if I still have those old books, my kids would like them. SO funny! I'm restyling my bedroom and pulled out "Where the Sidewalk Ends" to keep on my nightstand as Decor/light prebed reading. It was not only a blast from the past but there are some adult meanings deep within those poems! For some reason Recipe for a Hippopotamus Sandwich was always my favorite. I was just reading one of his poetry books the other day. I have them all on my bookshelf and I remember reading them straight through as a kid. Hug o' War has got to be one of the most touching things! Adore this and want to find it and frame it! This was an awesome blast from the past. I love these. The Giving Tree was one of my favorites. I love Shel Silverstein! There's one that's like two pages long about the unicorns missing the ark and that's why they aren't here anymore. I remember my mom had that one memorized. This makes me want to go find my Shel Silverstein books! I love Shel Silverstein, one of these days I'm going to go get all my books from the attic and read through them! 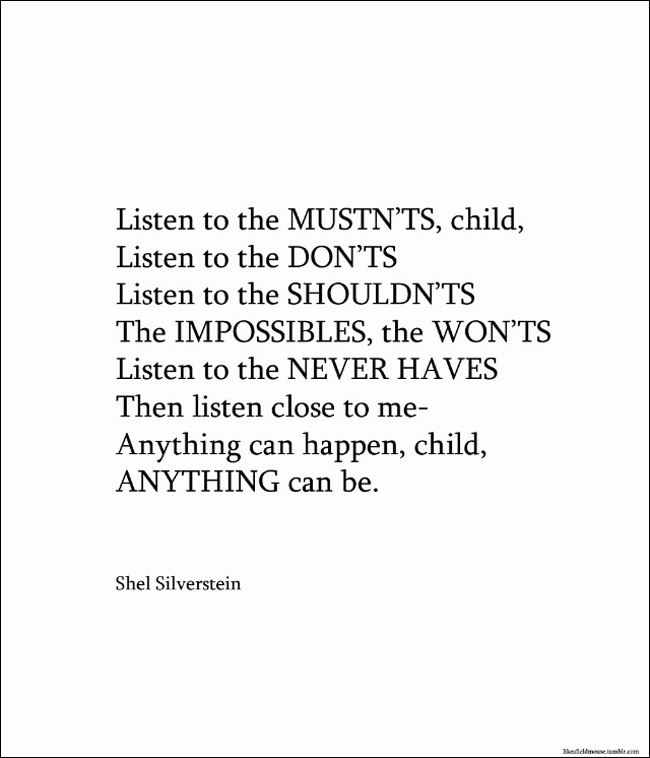 Love Shel Silverstein. I'd say one of the most enjoyable things about being a mom is getting to read through our old childhood books with Stella and to remember how different our perspectives were when we were little, compared to hers and also to our own new perspectives as adults. As a child my favorite movie was The Never Ending Story, and of course Stella loves it now, too! I forgot how much I love these! Reading all of these just made me so so happy. 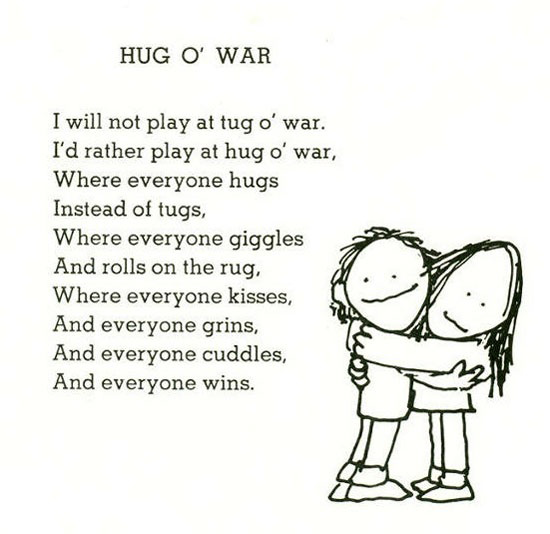 My favorite is the hug o' war. So presh. I've never heard of this poet before. She's great. I love that first poem .. a lot. Up was such a great movie, wasn't it!? It was so heartfelt and sweet... I like this post today. One of my fave books as a kid was one of his! 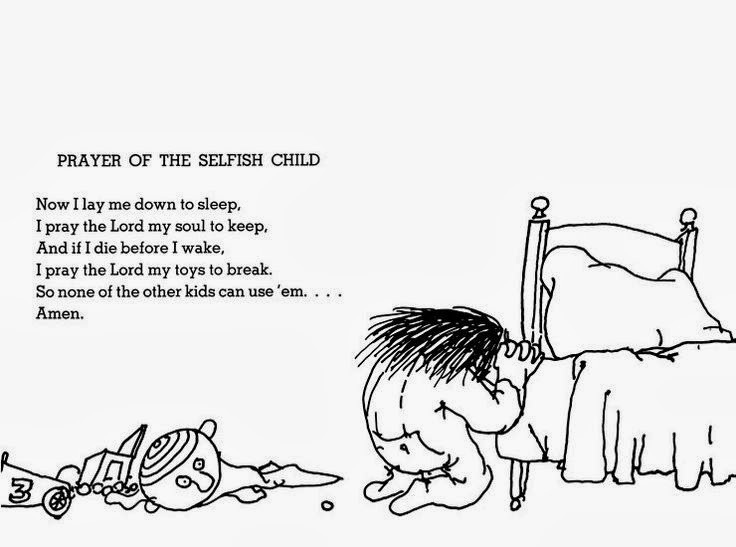 I had a similar experience recently when reading Shel Silverstein to my friend's little girls. I was getting all emotional reading some really brilliant words that apply to me as an adult more than I ever thought possible. Shel (yes we're on a first name basis...) is the best! Brod Bagert was really big at my school, pretty sure because the librarian and he were friends. Ever heard of his books? Here's a link to one of the more popular ones (http://www.brodbagert.com/books/detail/22/Chicken-Socks-and-Other-Contagious-Poems). I even have a few autographed copies of his books. I really just love this throwback a lot. So many memories.